A migraine is categorised as the kind of headache which involves severe pain accompanied by sensory discomfort leading to blind spots. Migraine can also cause physical tingling along with nausea and vomiting. Migraines also cause increase sensitivity towards light and sound. These headaches can be extremely painful inducing continuous discomfort as they can last for hours and in some cases, the headaches continue for days. There is no fixed cause for migraine and the studies have not been able to deduce the exact cause. Home remedies for Migraine are the only feasible solutions which can alleviate the situation and make it bearable. As aforementioned, the exact cause of this illness is still unknown. 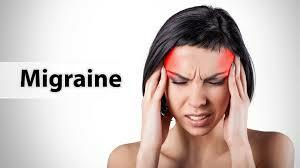 Therefore, myriads of symptoms have been associated with this illness in lieu of understanding what is migraine. Constipation, Mood changes, frequent yawning and an urge to drink more water are some of the common symptoms. These fall within the prodrome stage of migraine and these symptoms inform about the upcoming discomfort. Vision loss, tingling sensation in an arm, difficulty in speaking, hearing noises and seeing flashes of light are some of the visual symptoms of migraine. Increased sensitivity towards light and sound, throbbing pain in the forehead area or the entire head, blurred vision, nausea accompanied with vomiting are some of most discomforting symptoms of a migraine attack. The symptoms do not completely subside even after the attack is over. After a migraine attack, a person might feel confused, dizzy and weak. Sensitivity to light can still be present. Since there is no operative procedure or surgery for treating migraine, it has always been a little difficult to figure out how to cure migraine. Therefore, home remedies are usually the best choice to treat the illness. Apple cider Vinegar is helpful in treating migraines. It is rich in antioxidants and controls blood sugar while regulating blood pressure. Add honey and a tablespoon of vinegar to form a mixture with water. Drink on a daily basis. Applying ice pack on the affected area helps in numbing the specific part of the head which further alleviates the pain. Use a towel to wrap up the ice and apply on forehead and temples. Massaging the head stimulates serotonin receptors and blocks pain signals. Use two fingers to gently massage the entire head. Apples can be an effective home remedy for treating migraines. The smell of green apple can help in alleviating the pain. Peppermint tea has anti-inflammatory properties and has a calming effect on the nerves. Peppermint essential oil can also be massaged onto the temples. Leave the oil for half an hour and repeat this for 2-3 times a day. A healthy lifestyle sans tobacco smoking, alcohol and other drugs will improve the overall health thereby reducing the frequency of migraine attacks.